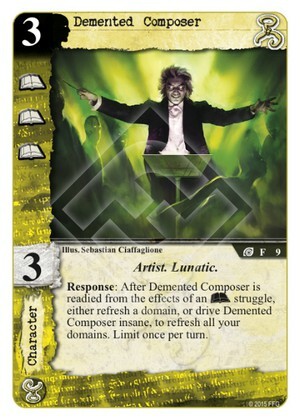 Response: After Demented Composer is readied from the effects of an (A) struggle, either refresh a domain, or drive Demented Composer insane to refresh all your domains. Limit once per turn. Ludwig would be awesome if you could play characters or supports again after story phase, but you can't. So his main merit is to clear your domains to play counters and other nasty events during your opponent's turn - and keep him cautious and insecure. He'll have to survive combat, easier if Patron is around... I wish you could simply drive him insane to refresh a domain. 3/5. A prime candidate for Fregoli Delusion. Sneak him into a story right before arcane struggles.